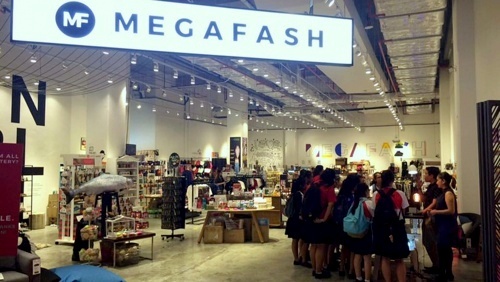 Design & gift store chain Megafash has five locations in Singapore, including one within Suntec City (3 Temasek Boulevard). Megafash features a wide range of exciting products ranging from well-known manufacturers to independent, upcoming design brands. The company’s specialty area is featuring and supporting local and independent makers from all over the region, providing a platform for the brands to tell their stories. You can shop the product range both at the physical stores and through the company’s internet store (www.megafash.com). Megafash webstore has products from more than 440 cool brands, sourced globally. …Stationery (notebooks, greeting cards, art & prints, stickers, books, gift wraps, desk accessories), as well as Accessories (bags, gadgets & tech, watches, jewellery, belts, wallets, iron-ons, pins & brooches, ties & cufflinks, caps & hats, card holders, scarves, keychains, glasses & sunglasses). Note that the physical stores do not carry all the items available on the website (Megafash Suntec City, for example, has over 200 brands represented), so you should always ask the company directly before heading down to the offline shops. The official Megafash Singapore Facebook page is available at www.facebook.com/megafashsg. Megafash Facebook page is a great place to discover new designs available at the stores, highlights among the brands, Megafash events, promotions, and much more. …Urban X Maps, Vechen, Venque, Vice, Vigar, Vogmask, Voila Leather, Vue, Vy, Wackymons, Wakatobi Eyewear, Wallet Ninja, We Are The Walrus, Wear A Wish, Wheniwasfour, Whimsy Whimsical, Whiteoak, Wild & Wolf, Winter Organics, Wonderri, Woodka, Woodview, Wunderlust Stationery, Xhundredfold, Yarra Valley Tea, Ye! !, Yes I Did, Yhf Manila, Yolky Chips, Zest Livings, Zing Anything, Zipit, Zulu Zion.